Tagging along. We used to do this on the sleigh. So, Rebecca, does your Dad have to come along on EVERY date? “The Strasburg Amish Bus Company”. My Old Order Mennonite Friends have a horse drawn wagon that comes around and picks up the children for school. They kiddingly call it the horse bus. For this picture how about the horse cab? Reminds me of being a kid and jumping on the back of someone’s bike. Standing on the spokes. Strasburg is one of our very favorite places and our first choice when we start that search for our retirement in Lancaster County. I have dreams of living right outside of town and being able to stroll in whenever I want to! I think my husband would really enjoy being a volunteer at the rail road. Just pretend he isn’t there, and he’ll go away! Tailgating allowed in Amish Country! MIND IF I “HOP ON”? Shhh! They don’t know I’m here! A great big thank you to all of the above posts!!! With everything black, I had a difficult time seeing the contrast of the man and the buggy. Everyone else’s sharper eyes & wonderful descriptive captions helped me clarify what I was supposed to be seeing. Thanks again to the Amish America community of friends! As a chimney sweeper, I ask good lad, which chimney down the road is it? From the other comments, I like Tagalong, Back-seat driver, and Big Brother is watching! Thanks for the fun, Erik! Some of the sayings below are from the book, POPULAR PROVERBS & SAYINGS, by Titelman. She’ll be comin’ round the mountain. There’s no such thing as a free ride? I wouldn’t want to be in his shoes. Give him an inch, and he will take a mile. Don’t let your left hand know what your right hand is doing. Let’s get America moving again. Not holding on to his hat. From this position, I can whip the driver. Wow I’m really enjoying all these creative entries from you all 🙂 So much so that I’m going to pick 5 finalists from these captions, and we’re going to do a vote for the best. Look for that tomorrow! 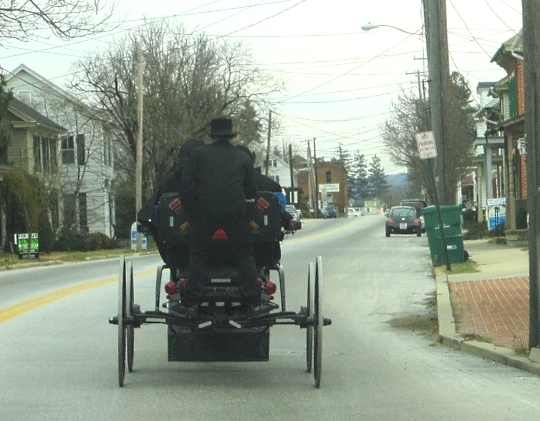 Amish Driving Instructer: “Easy now. Give ‘er just a little more rein”. This is what I get for hitchhiking! Reminds me of the guys that ride on the back of garbage trucks; an Amish Garbage Truck!